Mainstream media figures from the New York Times to the Huffington Post to CNN are apoplectic Monday as their latest attack on Donald J. Trump, the Republican nominee for president, has crumbled yet again under the slightest bit of scrutiny. 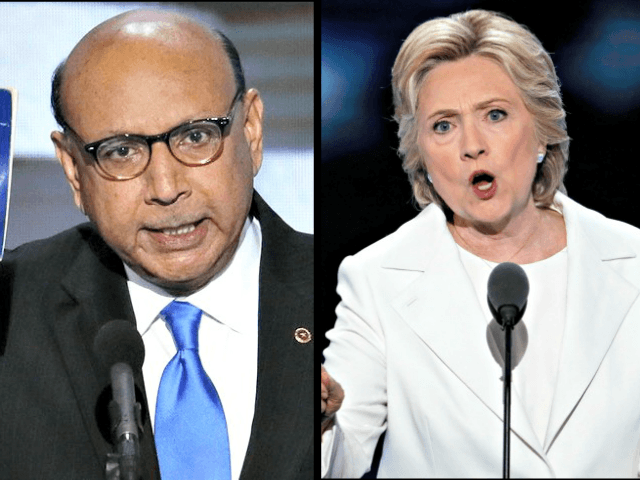 Specifically, the newest line of attack to fall apart is the criticism of Trump over Khizr Khan, the Muslim Gold Star father who spoke at the Democratic National Convention last week. All of this information was publicly available, and accessible to anyone—including any of these reporters, and Breitbart News—with a basic Google search. Anyone interested in doing research about the subjects they are reporting on—otherwise known as responsible journalism—would have checked into these matters. But clearly, none in the mainstream media did—probably because, as Fox News’ Chad Pergram noted, Democrats “sense blood in the water over” the whole Khan controversy. Earlier on Monday, as CNN host Kate Bolduan stacked a panel with three anti-Trump analysts against Scottie Nell Hughes—the only Trump supporter present—Bolduan admitted she has not done basic research about Khan. “I have no idea what you’re talking about, what law firm he’s connected to,” Bolduan, a CNN anchor, plainly admitted on live television on Monday during a discussion with Hughes. Hughes was pressing the very easily publicly accessible information that Khan worked at Hogan & Hartson, the firm that would eventually become Hogan Lovells LLP—a firm that as Breitbart News has demonstrated is highly connected with the Clinton apparatus and with the Saudi government. And Bolduan was proving she had no idea what she was talking, quite literally—as her direct quote admits. when Bolduan says of Khizr Khan: “I have no idea what you’re talking about, what law firm he’s connected to.” — that she did not do any basic journalistic research on the subjects she was hosting a panel on. Is that acceptable by CNN standards? 2.) Does CNN plan to, in the future, have a discussion about all of Khizr Khan’s various connections to the law firm that A) prepared Hillary Clinton’s taxes, B) helped with various aspects of Hillary Clinton’s illicit homebrew email server, C) is paid by the government of Saudi Arabia for representation here in the United States, among other things? 3.) Does CNN plan to, in the future, focus on the fact that Khan now runs a law firm that financially benefits from opposition to Donald Trump’s policies on migration — specifically that he aims to represent aspiring EB5 visa holders, who pay large sums of money to enter the country, a program that the Senate Judiciary Committee has uncovered as having major flaws? 4.) Has anyone at CNN done any work digging into any of this? You’re aware it’s all publicly available with a simple Google search and would have taken a junior producer less than an hour to find it all out? Meanwhile, hours after Breitbart News presented this information publicly in a coherent report on Monday, others in media engaged in willful distortion of the story’s origins. And, the predictably gross oppo dump on the Kahn family has begun. https://t.co/Ma3XXzqGjN again, their kid DIED fighting for America. “I’ve never seen a thinner oppo dump in my life,” Lowery Tweeted with the link. For the layman reading this piece, an “oppo dump” refers to opposition research provided to a media outlet by a campaign or political operative. Said research is usually negative facts, provided to put together a counter-narrative in the media more beneficial to the provider’s cause. There have been plenty of times where this reporter has relied on opposition research from a variety of parties for a given story, but this story was not one of those times. All of the information on Khan was very easily accessible via the Internet, and easily checked online via public sources. So the idea that this was somehow an “oppo dump” from Trump’s campaign or anyone else for that matter is not just silly, it’s untrue. But that being said, each of the three mainstream outlets handled the detailed questions from Breitbart News about their inaccurate assumptions in a different way. “I was just joking! It’s like no one in the media knows sarcasm when they see it anymore,” the New York Times’ Confessore said in an email to Breitbart News. While he did provide that quote brushing off the frivolous claim he made on Twitter as merely a joke, Confessore didn’t answer the full set of questions he was sent. 2.) Are you aware all of the evidence contained in the article is publicly available through Google searching online? 3.) Did you — or anyone at the NY Times — do ANY of your own research into this guy’s connections back to the Clintons and to Saudi Arabia? 4.) Is it standard operating procedure at the NY Times to make claims that aren’t true like the one you just did on Twitter without any evidence? Or is this just a one-time thing? 5.) Did anyone at the Clinton campaign–or anywhere else–send you my article, or did you just find it on your own at the exact same time (3 minutes earlier) as the Huffington Post’s political editor? The Huffington Post’s Stein, on the other hand, outright refused to answer any questions. “I’m going to decline comment here,” Stein replied when sent a list of his own questions. 3.) Did you — or anyone at the Huffington Post — do ANY of your own research into this guy’s connections back to the Clintons and to Saudi Arabia? 4.) Is it standard operating procedure at the Huffington Post to make claims that aren’t true like the one you just did on Twitter without any evidence? Or is this just a one-time thing? 5.) Did anyone at the Clinton campaign–or anywhere else–send you my article, or did you just find it on your own at the exact same time (3 minutes later) as the NY Times’ Nick Confessore? Lowery from New York Magazine, meanwhile, laughed off the questions. “My response, quotable, in its entirety: lol,” she wrote in an email back to the specific questions she was sent. 3.) Did you — or anyone at NY Magazine– do ANY of your own research into this guy’s connections back to the Clintons and to Saudi Arabia? 4.) Is it standard operating procedure at NY Magazine to make claims that aren’t true like the one you just did on Twitter without any evidence? Or is this just a one-time thing? 5.) Did anyone at the Clinton campaign–or anywhere else–send you my article, or did you just find it on your own at nearly the same time (within minutes of) as the Huffington Post’s political editor and a NY Times reporter who used the exact same phrase “oppo dump” as you did? Lowery did, however, somewhat answer some of them in follow-up Tweets. But, facts be damned, the entire mainstream is on a warpath to try to stop Donald Trump and elect Hillary Clinton. It’s also worth noting that each and every one of them is in their own right working to undermine Trump and elect Clinton. Stein is the easiest example of this. His outlet, the Huffington Post, includes a disclaimer on every article about Trump labeling him a racist–and the progressive media service is outwardly in favor of Clinton over Trump in November, plainly stating it does not want Trump to win. Confessore’s New York Times has repeatedly tried and failed with hit pieces on Trump, most notably a piece in May claiming he was sexist toward women. And Lowery, in New York Magazine, wrote a piece last week during the Democratic National Convention in Philadelphia oozing with praise for Hillary Clinton. “What it was like to see Hillary Clinton make history,” was her headline, under which she gushed her heart out for dear Hillary Clinton. This week, Hillary made history. Her campaigning has sometimes felt bloodless. The press has tended to be measured in its assessment of her, and sometimes downright mean. The convention has felt at times like a coronation. But in the Wells Fargo arena, as the DNC came to its end, there was joy, togetherness, excitement, elation, hope, change, love, and enthrallment. The glass ceiling crashed, and thousands and thousands of balloons showered down on Hillary as the crowd screamed and cried. There was rapture. And it was because that woman is Hillary. Too bad, guys. The attack line isn’t working. Ironically, your friends over at the Washington Post and USA Today seem to have figured this out already. Hillary Clinton’s three-day bus ride across battleground Pennsylvania and Ohio was supposed to celebrate her nomination with running mate Sen. Tim Kaine, showcase her plans to add jobs and ring a bell for the fall election. It ended up being mostly about Donald Trump. At nearly every stop through two states Democrats must win in November, Clinton and Kaine talked about the Republican almost as much as they talked about themselves. She invoked him sometimes with red-meat outrage, sometimes with a tone of disbelief and sometimes for laughs. Why are Clinton and her media allies like Confessore, Bolduan, Lowery, and Stein doing this? Perhaps it’s because there’s nothing else they can use to sell voters on Clinton. So all they’ve got left in the toolbox is to try to trash Trump–a tactic that didn’t work before as Republican after Republican failed to stop him doing the same thing–as the Washington Post‘s Gearan reported. And why is it that Hillary Clinton and Tim Kaine are failing to gain any traction whatsoever among voters throughout the rust belt? Perhaps a Democrat from Pennsylvania, Erin McClelland, who’s running to represent Pennsylvania’s 12th Congressional district summed it up best in, of all places, USA Today. “They feel the Democratic Party has abandoned them, talks down to them, calls them stupid,” McClelland said of voters throughout the rust belt.